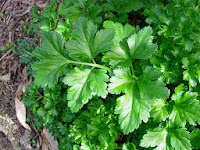 Parsley is an annual herbaceous plant and is used as a medicine and as a spice. It is used mostly fresh and is very rich in vitamin C. Parsley contains oil and various ingredients that are used for treating sterilization and the absence of menstrual periods. Parsley reacts positively on the increase of urine, but it also has other medicinal properties. Through its active ingredient, apiolaona, reacts on the blood vessels, causing them to strengthen and stimulate muscles through which these vessels go, especially stimulating muscle fibers of the bladder, intestines and uterus. Therefore, the juice of this plant is used to treat diseases of the genital organs, especially for irregular menstruation. Parsley is most effective if taken in the form of juice with a certain amount of the juice of celery. While the tea made of parsley is mostly used to rinse wounds. it helps with better digestion. Pour over the 20 grams of fresh parsley leaf half a liter of boiling water. Allow it to stand for 10 minutes, then strain and cool. Tea is drunk in small amounts throughout the day.